German Version DVD Release: September 26th! Good news for everyone who loves documentaries and yoga! 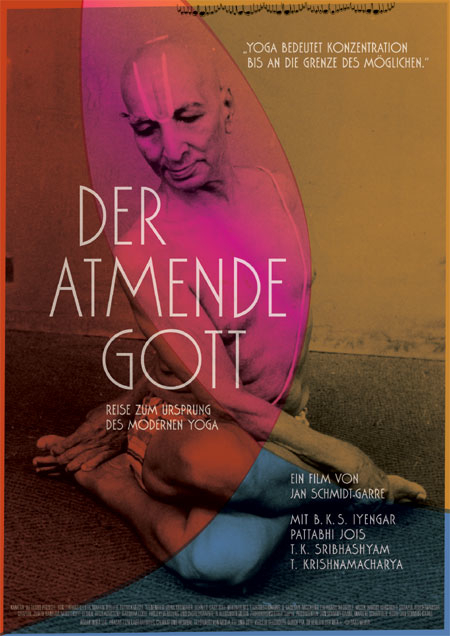 Breath of the Gods, a film about the roots of modern Yoga has come to our cinemas and is now on DVD. Yoga.in was invited to the Berlin premiere this past spring. It was a pleasure to watch the film and talk to Srishubha, T. Krishnamacharya’s daughter. 1) He visited a yoga class and felt the “irresistible“ connection of body and mind. 2) He learned about the central role of T. Krishnamacharya, the “father of modern yoga,” in the development of yoga as we know it today. While Krishnamacharya himself died in 1989 at the cheerful age of 101 years, his major disciples Pattabhi Jois (Ashtanga yoga) and B.K.S. Iyengar (Iyengar Yoga) were still alive and teaching. What an amazing opportunity! Over a period of 5 years Jan and his team visited India several times. Krishnamacharya’s son and daughter, T.K. Sribhashyam and Srishubha, became a vital part of the film which includes wonderful old footage rediscovered during production. The German version DVD release is on September 26th and you can get it on Amazon.de. Thanks to its success in Germany, Austria and Switzerland with over 90,000 viewers, it will also be released in English in theaters in the UK and the US this winter and out on DVD in the Spring of 2013. For more information and to view the trailer, visit the English Version of their website or the German Version. We say: Two Thumbs up! How can I buy this DVD? You may buy it at Amazon.de. But it’s in German only at the moment. It should be released in English in a few months. We’ll probably post an update when it’s available. All the best!